American Tank Co / BH Tank Works Ammonia Diffusion Tanks (ADT’s) are designed for long-term storage of fresh water for availability in emergency evacuation and diffusion of hazardous materials situations. For Ammonia Diffusion applications, ADT’s are equipped with an internal stainless steel sparger tube designed for compliance with ASHRAE and ANSI/IIAR2 Standards. All ADT’s are designed and manufactured to meet Uniform Mechanical Code as well as International Building Code structural requirements. Tank and Foundation design with a CA Structural Engineer Wetstamp is provided at no additional cost. Our BH Tank Works division has over 20 years of experience delivering emergency gas evacuation tanks so you can rely on American Tank's Ammonia Diffusion Tanks (ADT's) for all your ammonia absorption applications. 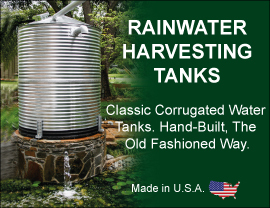 Fresh Water Storage Tanks per International Mechanical Code. Internal Sidewall Mounted Stainless Steel Sparger Tube sized to match Emergency Relief Header 24”- 30” Diameter Shell Manway with Bolt-on Cover, with Confined Space Warning Signage, Make-up Water Inlet, (FNPT, RFSO, Grooved) Overflow, and Drain Pipe Connections, (FNPT, RFSO, Grooved) Anchors Brackets for seismic and wind design load requirements, Roof Mounted Vent with Mushroom Cap and Screen, Lifting Lugs. ADT’s are offered in the following standard sizes to assist with budgetary pricing and expedited delivery. ADT’s can be provided in any capacity up to 40,000 Gallons but due to shipping and diffuser submersion depth restrictions, American Tank recommends multiple tanks to achieve discharge capacities that will require greater than 20,000 gallon capacities. American Tank Co / BH Tank Works Ammonia Diffusion tanks come with a One-Year Limited Manufacturers Warranty. Detailed Warranty Information and Maintenance Guidelines available upon request. For additional information please visit www.bhtank.com. *Due to Powder Coat Oven size limitations, tanks over 10’ Diameter and or 16’ Height are sprayed with chemically resistant Durethane DTM.